Madison, NJ (USA) – August 17, 2009 – Wearing body armour for protection against bullets and shrapnel has been a double-edged sword for soldiers. While the armour provides an indispensable defence, its weight and placement on the body exposes the wearer to neck, shoulder and back discomfort, and possibly years of lingering pain. The problem is not just the armour, but also the heavy equipment that soldiers routinely wear for hours and days at a time that can weigh more than 60 lbs – including rifles, ammunition, grenades, radios, medical kits, backpacks, water, and other supplies. To alleviate discomfort and reduce the fatigue that reduces the soldier’s tactical effectiveness, a new generation of body armour systems is being developed. 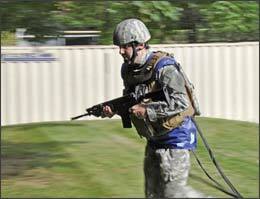 A body mapping pressure system by Sensor Products Inc. called Tactilus is enabling a highly-skilled team of designers and engineers to develop new vests and carriage systems that optimally distribute the load that soldiers carry. The project is being directed by KDH Defence Systems of Johnstown, PA through a contract with the US Air Force. EDGE Product Development of Newtown, PA is using human factors engineering, design and prototyping to adapt the armour systems to the needs of the soldiers. “To enable soldiers to perform their duties with more comfort and less fatigue, we are designing body armour systems that eliminate ’hot spots‘ of excessive pressure during typical activities,” says Daniel Massam, director of industrial design. 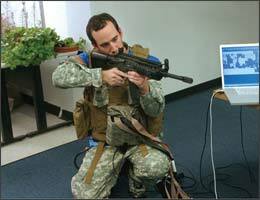 Dr. Evan Goldman, a professor of gross anatomy and physiology at Philadelphia University, is using the sensor technology to test the body armour on the soldiers. “The pressure mapping sensor system shows us any pressure points that develop, not just when soldiers stand in place but also when they perform ballistic motions – such as jumping, running quickly, turning, crouching or crawling on their bellies,” says Dr. Goldman. “By viewing images and statistics from sensors located beneath their vests, we can see how these pressure points move with the body in real time as they perform their manoeuvres”. When a soldier complains that they feel pressure in a certain area, the pressure points change on the computer screen and pinpoint where the vest and armour need to be redesigned to improve the pressure distribution. Besides increasing comfort, the team says the new body armour will significantly increase the soldier’s flexibility and manoeuvrability, which has enormous strategic advantages in the field. Pushed to their creative limits, participants in the project are breaking new ground. Jason Blume, an engineer at Sensor Products, discovered new uses for their Tactilus electronic sensor system when he suggested the sensors could work in a new configuration to fit the size and shape of the vest and carriage. “The challenge for us in sensor technology was to modify our sensors and software to conform to the dimensions of a vest, while providing full three-dimensional pressure distribution visibility of the chest, back and neck,” says Blume. Previously Sensor Product’s systems had supported square or rectangular designs, such as mattresses for ergonomic testing. While they were optimistic, there were questions about whether the sensors’ electronic lines could be cut and reconfigured to the vest. Three separate sensor pads needed to be used for the chest, back and waist, and clear colour-coded body images and precise statistics had to be produced without signal interference. Sensor Products split up the sensing points; rows of sensors were distributed into two connecting L patterns, with one L inverted to face the other to provide coverage for the neck, shoulders and trunk. A third sensor pad was configured to wrap around the soldier’s waist. The software was broken up into multiple pieces for full system functionality. 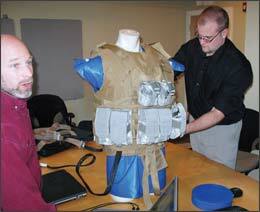 The sensors were then melded into the vest to serve as a guide for future prototypes. Jeffrey Payne, Project Manager of KDH Defence Systems, says the project is on track to meet its goals. “Most armour designs today are from within the armour industry, but by using a human factors company like Edge that thinks outside the box, we come up with unique and innovative approaches to better protect the soldier,” says Payne. “Armour designs today are over the body and wrap like a jacket. Edge looks at applying different ways to take off loads, making the vest and armour wrap around the wearer so tightly that it becomes load bearing,” adds Payne. Headquartered in New Jersey (USA) and established in 1990, Sensor Products Inc. is a world leader in the manufacture and distribution of tactile pressure sensing solutions. Their customized and off-the-shelf products are installed within all of the Fortune 500 industrial companies as well as thousands of smaller manufacturing firms. Their sensors are used in applications as diverse as tire testing to semiconductor manufacturing and from R&D labs to space missions. Additionally, Sensor Products provides in-house and on-site stress and pressure mapping analysis, as well as a variety of regional technical seminars. Founded in 1985, EDGE Product Development is an ISO 9001:2000 certified, full-service product engineering consultancy specializing in supporting the development of new technologies and devices for the military/security, commercial and medical product communities. With an integrated product development team approach and over 20 years of innovation experience, EDGE is the ideal partner to transition technology from the research lab or development group to the customer.